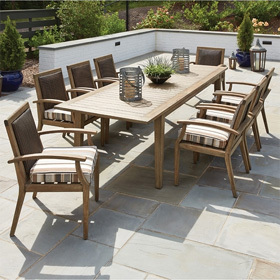 Be ready to eat outside with the Woodard Colfax Patio Dining Set has what you need. Four Dining Chairs and a Round Deluxe Dining Table with Trellis Top need only to have you set out a meal and enjoy. The high quality extruded aluminum frame gives you a level of quality unmatched by anything else. Your style can be reflected by your choice of our variety of powder coated finishes. Gather around on this patio set and you'll be surprised at just how often you want to use it. Dining Chair 25.75"W x 28.5"D x 35.5"H 34 lbs. Table 42"L x 42"W x 28"H 44 lbs.